The Pink Legacy used to belong to the Oppenheimer family, which for decades ran the De Beers diamond mining company, but auction house Christie's refused to say who the current owner was. An exceptionally rare 19-carat pink diamond fetched $50 million (44 million euros) at auction in Geneva Tuesday, Christie's said, setting a new per carat record for a stone of its kind. The Pink Legacy, which once belonged to the Oppenheimer family which for decades ran the De Beers diamond mining company, was snapped up by American luxury brand Harry Winston, part of the Swiss Swatch group. "$2.6 million per carat. 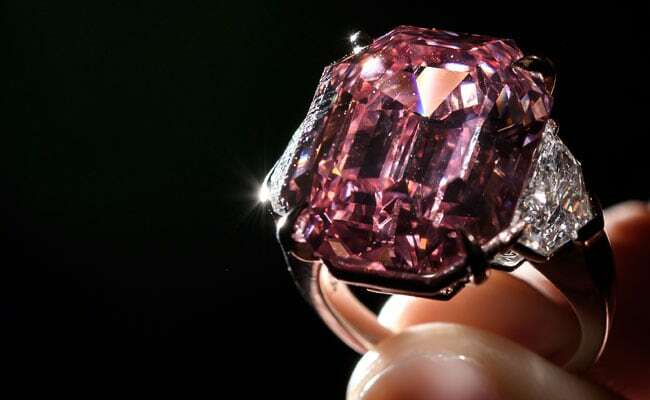 That is a world record per carat for a pink diamond," said Francois Curiel, head of Christie's in Europe. "This stone is for me the Leonardo da Vinci of diamonds," he added. The stone was immediately rechristened the "Winston Pink Legacy" by its buyers. Christie's international head of jewellery, Rahul Kadakia, described The Pink Legacy as "one of the world's greatest diamonds". The rectangular-cut diamond has been graded "fancy vivid" -- the highest possible grade of colour intensity. The stone was discovered in a South African mine around a century ago and was probably cut in the 1920s and has not been altered since, Christie's said. "Imagine a domino that you have cut the corners off of," Jean-Marc Lunel, an international jewellery specialist at Christie's, recently told AFP. He pointed out that the cut is a "classical so-called emerald cut", which stands out from the typical, more rounded, multi-facetted cuts used today. The classic rectangular cut is traditionally used for white stones, but is rare for pink diamonds. Christie's said the Pink Legacy is "the largest and finest Fancy Vivid Pink diamond ever offered at auction by the company," calling the stone "incomparable." "It is probably the most beautiful (specimen) ever presented at public auction," Lunel said. Christie's, which had refused to reveal the name of the seller, said only four vivid pink diamonds or over 10 carats have ever been offered at auction. One of them, the nearly 15-carat Pink Promise, was sold last November at a Christie's auction in Hong Kong for $32.5 million. That amounts to $2.176 million per carat, which was previously the world auction record price per carat for any pink diamond.